Started in 2008 at the National Weather Center on the University of Oklahoma in Norman, SSWIM was supported by a partnership between the National Oceanic and Atmospheric Administration and the University of Oklahoma. As of May 2012 SSWIM activities are carried out in Norman, OK, Colorado Springs, CO, and London, Ontario, Canada. 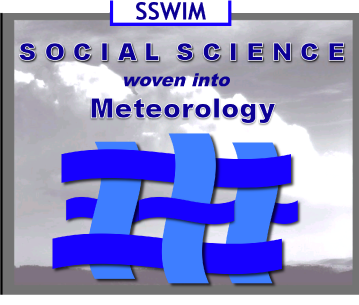 SSWIM weaves social science concepts and methodologies into the fabric of weather and climate applications and considers the complex problems at the intersection of weather, climate, and society. SSWIM addresses many challenges and opportunities including, but not limited to, improving forecasts and warnings, reducing social vulnerability to natural hazards, and understanding community and cultural adaptations to weather extremes.